Guam Men’s Basketball has been lighting up the FIBA Asia Cup this past week and the trend of international basketball competition will continue next week as the U15 team will venture off to Papua New Guinea to compete in the U15 FIBA Oceania Championships. This will be an inaugural event for FIBA Oceania, offering a tournament of this style to U15. Guam Basketball quickly jumped at the opportunity to participate in the event with head coach Brent Tipton and assistant coach Reggie Guerrero leading a talented crop of Guam’s U15 boys, comprised of some of the best high school and middle school ballers on island. The team is set to depart for PNG on Saturday December 1st. Guam’s U15 boys will face New Zealand on December 5th at 5 pm Chamorro Standard Time. Guam will find themselves in a pool of Oceania’s best as they will have to play the top two teams in Australia and New Zealand. With this being the first year, expectations to win aren’t overtly stressed, but growing into a better basketball player is coach Tipton’s goal for the team. “We define our expectations, as cliche as it may sound, to get better every day and every game. We’ve been measuring it through filming our practices and showing the kids their progressions. When we’re down there, we want to make sure that every game we play we statistically getting better, both defensively and offensively. That’s how we’re going to measure how we get better,” said Tipton. The team has been preparing for this particular tournament for three months and the team just hit their 50th practice at the Guam National Basketball Training Facility in Tiyan, which shows where their commitment is at. “Out of the 50 practices we’ve had there has been only ONE practice where I’ve had nine or less players show up. Every other practice we’ve had, there has been 10-12 people show up. That’s how dedicated this group has been, which has been absolutely remarkable. Not just the players, but the parents have been 100% invested, which is huge. Their desire and commitment has been a great reflection of them as young men and a reflection of their parents as well,” added Tipton. The team has been gaining confidence after each and every practice and they are well aware of the opportunity that lies in front of them. 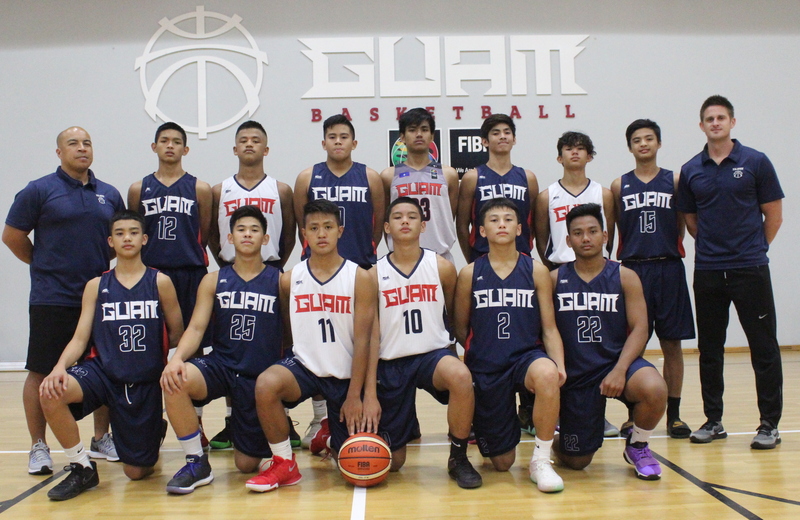 Being able to showcase Guam’s talent on the international stage at such a young age isn’t phasing Guam’s U15 boys as they are more eager than nervous to hit the court. “We realize this is a great opportunity presented to us and we’re very proud to be able represent our island. We believe that we’ve worked as hard as we could have these past 14 weeks and we’re very confident heading into this tournament,” said Elijah Garrido. “We know that there is going to be some tough competition out there, but we’re trying to medal right now and we want to do our best to put Guam’s name out there. The men’s team is already out there doing their thing and we want to eventually get to that point as well,” said Matthew Santos. Despite the obvious height disparity Guam always faces when playing international ball, the team has game planned to utilize their speed and shooting to make the difference. “We’ve got a lot of speed and we do a lot of running and conditioning in our workouts. We’ve also got a lot of good shooters on the team so that’s what we’ll be focusing on,” said Santos. And the teams chemistry has been functioning at high levels which will only bodes well for the young hopefuls despite the inclusion of middle school and high school ballers. “We’ve had a very long time to practice together and even outside of basketball, we all know each other personally so we don’t see any differences here. We see ourselves as one team with one common goal, and that’s to win,” said Garrido. “Everything has been good. It’s basketball so everyone one of us wants to play, but we’ve been gelling great together and we all show up to practice so our chemistry has been great,” added Santos. Coach Tipton has been a part of Guam basketball for over five years and his venture to Papua New Guinea will be his biggest test yet. He’s thankful for the opportunity, but his dedication to see his players succeed is all Tipton truly wants. “I have aspirations as a coach to be successful, but I want these guys to experience what it means to represent Guam at a high level and be rewarded for their hard work. That, ultimately, means putting medals around their neck and that’s all I care about. I want them to feel that and I want them to give them the best opportunity and best experience that I can,” said Tipton.